Love music, get Logitech. That's the idea for the latest Logitech Ultimate Ear (UE) range, a collection of headphones and speakers designed with the music mad in mind. Announced at the ongoing IFA 2012 tech jamboree in Berlin, the precision-tuned assault on your ears kicks off with the Logitech UE 4000 headphones. Yours for £79.99, the drill here involves compact, on-ear efforts that major in sound quality but also include on-cord mic and controls for changing tracks and adjusting volume on portable devices. Oh, and you get plush memory-foam cushions to caress your ear lobes. Nice. Next, the Logitech UE 6000 around-the-ear headphones up the ante with active noise cancelling tech and a splitter for easy music sharing. And all for £169. From here, things get seriously pricey, with the Logitech UE 9000 wireless headphones hammering a £299-sized hole in your wallet. The 9000s feature a Bluetooth connection for wireless action but also support an optional cable if you want to go wired. You also get high resolution drivers, active noise cancelling and asymmetric memory foam and articulating joints that conform to the very contours of your head, along with controls for changing tracks and voice comms support. The final member of the new Logitech UE headphone family are the magisterial Logitech UE 900 Noise-Isolating Earphones. We're talking full-on audiophile action with three-way crossovers for a combination of what Logitech reckons is soul-stirring bass, heavenly highs and meaningful mid-range. You get a choice of two detachable and braided cables, one with a mic and controls, one without. 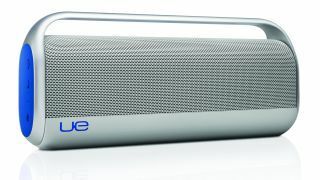 As for the speaker sets, the fun starts with the £79 Logitech UE Mobile Boombox. It's a portable speaker designed for use with smartphones and tablets. It supports up to two devices simultaneously and can be controlled from up to 50 feet away. A rechargeable battery delivers up to 10 hours of music and it can even double as a speakerphone for voice or video calls, natch. The Logitech UE Boombox, meanwhile, adds a little more oomph courtesy of eight custom-tuned drivers along with support for eight Bluetooth enabled devices (three at the same time). A six-hour battery rounds out the features for a total of £199. And finally...The Logitech UE Smart Radio is a one stop shop for all your online music needs. It supports playback of internet radio, online music services and the music on your PC or Mac. The LCD screen displays album art and track or station info while the app for iPhone and Android transforms your handset into a master music controller. Battery life on the Logitech UE Smart Radio is pitched at six hours and it's yours for £149. Logitech's UE kit ain't exactly cheap but has been knocking about since 2008 and was originally designed by none other than rock band Van Halen's monitor engineer. So now you know!